Weather Report: Low 49, High 97, Sunny. Well, I slept poorly, thinking I'd oversleep, so I woke up at 4:30am and just drowsed until a pair of hikers walked by on the trail 50 feet away at 5am. One of them swivelled her headlamp right at my tent and proclaimed "Look there's a tent over there! ", her companion shone her headlamp over to my tent as well and responded with "Yep, looks like a good campsite!" Here's a pro hiking tip: when walking by tents with people likely sleeping in them, don't shine your headlamps over there to check things out, and above all don't chatter. Tent walls are definitely translucent, and definitely not soundproof, especially at 4:30am. 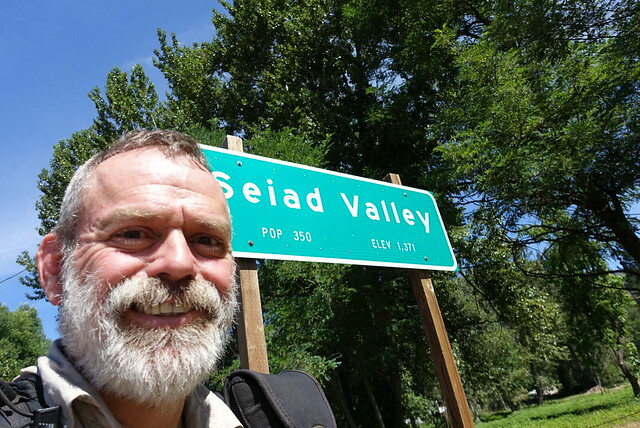 I figured that was my signal to get up, sigh, and head on down to Seiad Valley, 14 miles away. I really really wanted to get breakfast before the cafe closes at 2pm, so time to hustle! I pretty much flew down the first eight miles of trail, which was a fast but fixed up trail through forest that burned last November, then it was a tedious seven mile road walk. 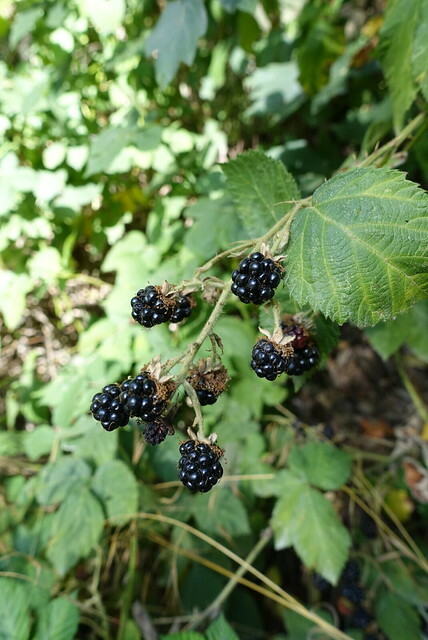 At least there were blackberry bushes along the road, so I had a pre-breakfast appetizer, and chatted with two women also out picking berries who wished me well on my journey. The cafe was hopping with six or eight other hikers, I sat down next to DreamTime and plugged in my batteries to recharge... then scanned the menu. Hell yes I'll take a coffee milkshake, the avo/bacon/cheese omelette with sourdough toast and hash browns, and a strawberry lemonade. Oh, and a liter of 7up from the store next door too. That should hold off my hunger for a couple of hours. DreamTime was also interested in getting up the trail in the evening, rather than stay at the RV park, so we teamed up... and waited for the 95+ degree heat to ease a bit. 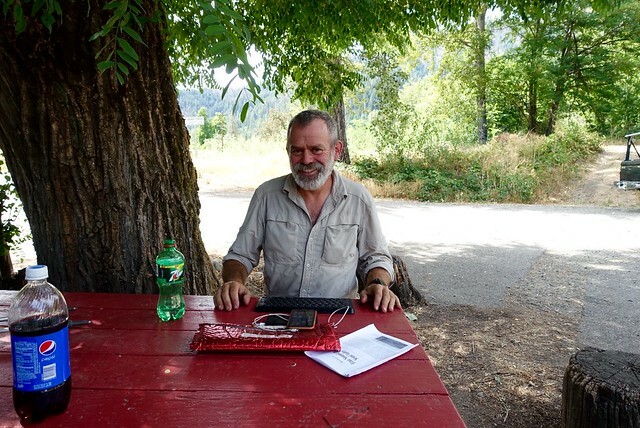 The picnic tables near the restroom had mostly decent wi-fi, so I updated pictures and blogged and chatted with other hikers who came and went. I also read through the pulled out chapters of that PCT guide I picked up in Etna. Hm. 60 miles to I-5, kinda 'transitional' section to get the PCT back to the Cascades, a fair bit of logging and trail-paralleling-forest-road action. Hm hm. It's also the weekend too, so things might be a bit more interesting. Maybe I can score a beer from a weekend camper :-). I also planned a bit more for later in Oregon, after I skip ahead from Ashland to Bend. I'm thinking I'll go into Portland for a couple of days from either the Timberline Lodge or more likely from Stevenson, WA, and just rest and catch up with a few friends. I could do the same in Seattle before I get to Canada, then return via Seattle. That sounds good. 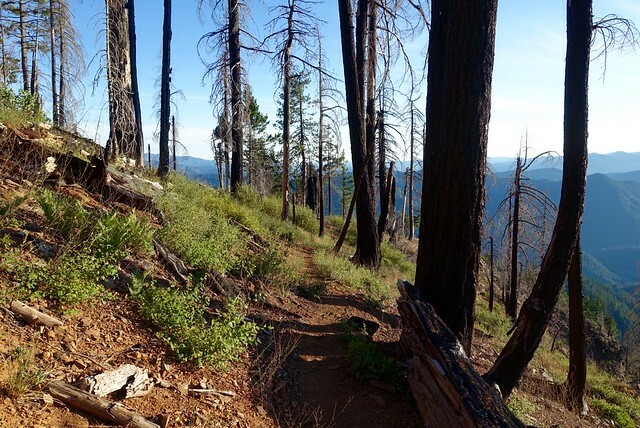 Then I had a less attractive thought that's been nagging at me since it came into my head around 3pm in the hazy heat: what am I looking forward to on the PCT in Oregon and Washington? Uh... the breakfast buffet at the Timberline Lodge. Goat Rocks. The North Cascades. And that's about it. The first of those, the Timberline, is a week's hike north from Bend/Sisters, then it's two weeks to Goat Rocks, then two weeks to the North Cascades. Hm hm hm. That's a lot of walking for just those things--especially the Oregon section. Do I really want to do all that, especially since I'm not going to be able to do all the PCT miles I had hoped for? Do I really even want to finish up Oregon and Washington, spend another six weeks on the trail? I'm heading into Oregon this weekend, I've completed most of the California bits of the PCT. That's a lot, maybe 2/3rds of it in total. Am I done? A good part of me says yes. Even though it's been three days, I really do miss the company of Junior, and today I was especially missing the company of Chris. Sure I was feeling content, but there was this empty little sadness along with the good feelings that kept on demanding my attention throughout the day. Why isn't Chris picking blackberries with me on the roadside? Why isn't he checking out the State of Jefferson tschotskes at the store? Why isn't he planning the next day and telling me all about it? It was just like there was a part of me that wasn't there. So I'm feeling a bit done with the PCT, and a bit homesick too. I've had these feelings before, but there's one other option that sounds rather appealing to me: take the rental car I have reserved in Ashland next Tuesday for two days, drive it to San Diego, and declare myself done... then relax at home for few weeks before our trip to Central Asia, do things like go to the beach or go to the zoo or check out the new breweries in the neighborhood or visit friends up in LA or see my nephew the critter. That really sounds a lot more appealing than grinding out miles just to say I've done it. I've done California, and that's a good chunk. So yeah, I got consumed with this line of thinking, walking up and out of Seiad Valley with Dreamtime. 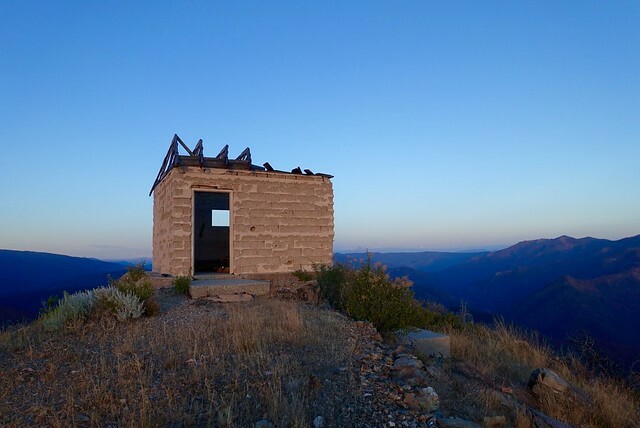 We stopped right around sunset at an abandoned fire lookout; I set up inside the roofless building. 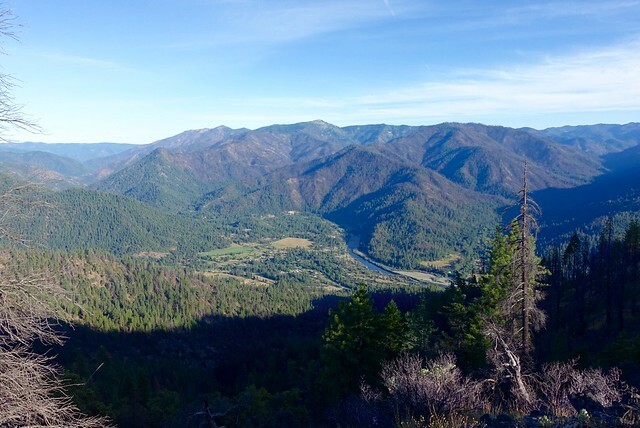 The hike was hard, up and up, and a bit hot, so I'm going to make sure my thoughts about being 'done' is just isn't the exhaustion talking like it was in Burney. It's best yet again to sleep on it, and see what tomorrow brings.